I like to imagine that every individual in every career dreamed of doing as a child exactly what they’re doing today. A young Nick Foles, of course, would have dreamed of leading his team to victory in the Super Bowl. My dentist would have sat in elementary school dreaming of scraping my teeth with perfect exaction. A 10-year-old future pope would sit on his bedroom floor before a crowd of stuffed animals imagining he was giving the sermon of a lifetime. What if I told you there was a statistic that combined all of your favorite stats (targets, air yards, rushing attempts, goal-line opportunities, red-zone opportunities, end-zone opportunities) into one and was more stable (0.48 r^2 to 0.46) than fantasy points? Here was my thought process that led to the development of this new metric. For wide receivers and tight ends, raw targets, with their 0.95 correlation to PPR fantasy points, is the obvious starting point. From there, we need to look at the value of each target — first, and most importantly, on where the quarterback was when he was snapping the ball. Intuitively, the closer to the end zone you are, the more valuable the target for fantasy (the higher likelihood the receiver has of scoring). The metrics bear this out. Beyond this, not all targets at the same line of scrimmage are actually worth the same. Targets with a higher depth of target have a higher expected value. For two important reasons, a ball thrown three yards from the line of scrimmage is worth less than one thrown 25 yards through the air. Although the expected catch rate is lower the farther the quarterback has to throw the ball, if caught, this receiver will have a 22-yard advantage (2.2 PPR fantasy points) and will be 22 yards closer to the end zone than the receiver seeing a target three yards out. This advantage outweighs the lower expected catch rate. 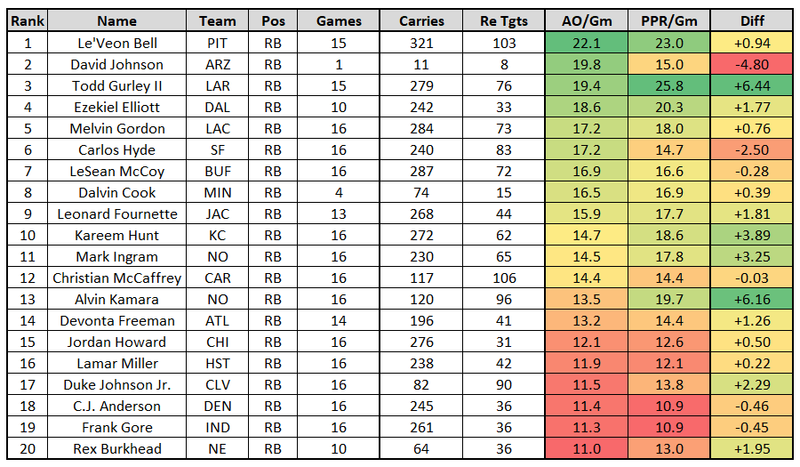 With running backs too, not all carries are worth the same. Like with receivers, the closer you are to the end zone when granted a carry, the more fantasy points you’re likely to score. Yes, you’re reading this chart correctly. Red-zone rushing attempts, when that carry is between 10 and 20 yards from the red zone, are almost wholly irrelevant. This is why you’ll frequently see my referring to “expected touchdowns” rather than red-zone opportunities when measuring a particular player’s scoring potential. Furthermore, a runner’s down and distance play a major role in expected fantasy points. If two running backs get the ball on the 50-yard line, the one rushing on first-and-15 will be more likely to outscore the running back rushing on fourth-and-1. The latter running back is at a disadvantage considering the opposing defense is likely predicting a run and will have more defenders stacked in the box. 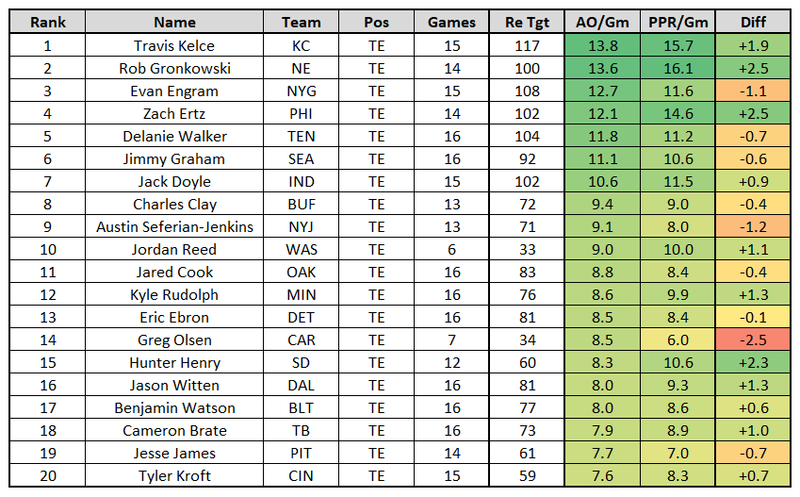 Actual Opportunity calculates all of these important disparate factors to determine which players have the best “actual opportunity” for fantasy purposes over the course of a season or in any given week. We do this by looking at an 11-season sample and calculating the value of each target at each depth (air yards) and each line of scrimmage. For runners we look at each carry at each line of scrimmage at each down and distance. When we total these two numbers, we can see their Actual Opportunity for the season, or how many fantasy points the average player would have scored if given the same opportunity. 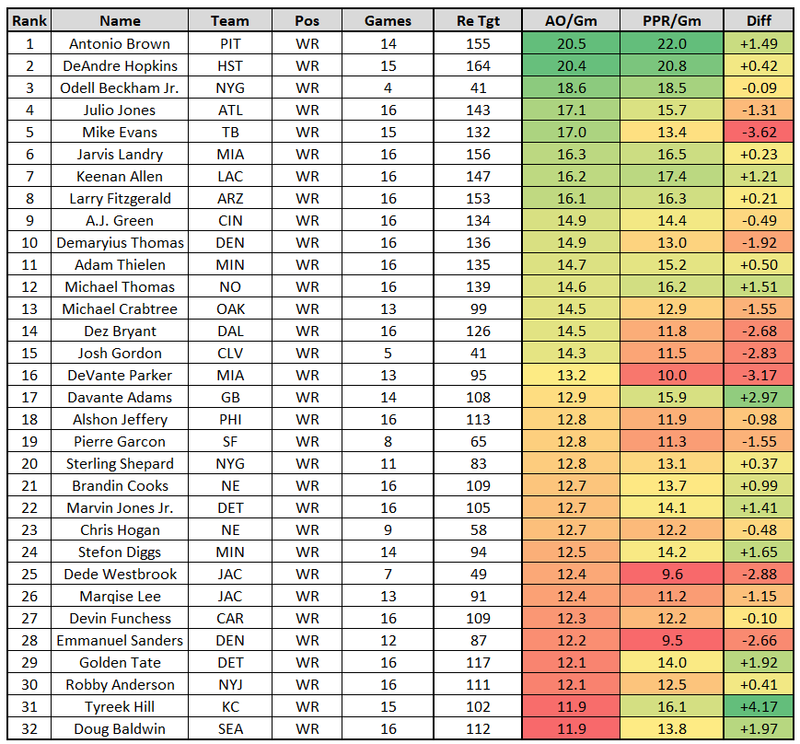 We can also see how these players performed for fantasy purposes above or below their expectation. Looking at raw Actual Opportunity numbers, we can see which players – if we can expect similar roles in 2018 – are likely to finish atop fantasy leaderboards. If we look at Actual Opportunity in terms of efficiency, we can see which players may be likely to fall back down to earth or might be due for some positive regression in 2018. Without further ado, here are 2017’s leaders by each position in Actual Opportunity per game. The charts below will be supplemented by a more in-depth writeup on each position — different numbers and players that popped out to me from 2017 and what this might mean for 2018 fantasy drafts — as they go live throughout this week.